We haven’t had church camp in a long time, so we’re creating an experience where we hope you Relax, Reconnect & Laugh with each other. Our aim is to get to know God and each other better and to have an unforgettable time doing both. There are activities for every age group and energy level. Some of the exciting things planned include an Amazing (G)Race, talent show, capture the flag, pampering session, workshops on interesting topics, bush walk, pool and river activities and amidst all this, time to relax in nature! Our camp falls during our 30 days of prayer journey as a church, so our camp theme is ‘Gratitude Changes Everything’. Cost: The prices below cover accommodation for the 2 nights, all (6) meals and activities. 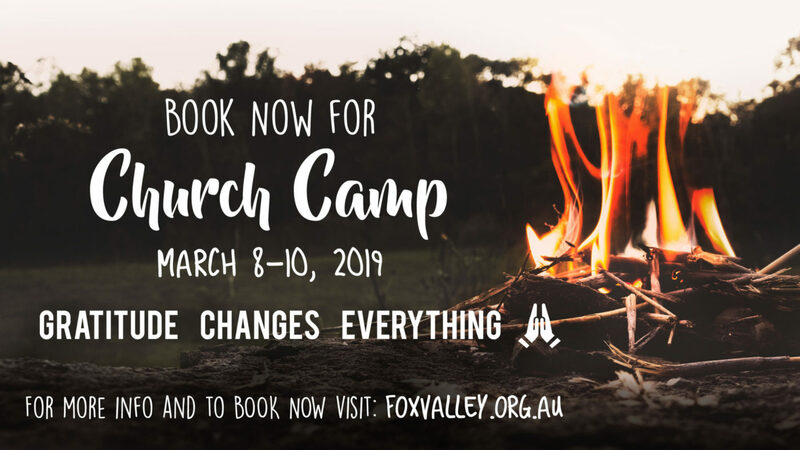 please contact Jo via info@foxvalley.org.au and book in for Friday, Saturday and/or Sunday – you will need to book in and prepay before camp for any day/s you will be attending. Those attending camp for the weekend will be staying in the Edilong accommodation, the rooms can sleep 6-8 people and there is a bathroom in each room. Families will be allocated their own rooms, wherever possible. There is also a dining hall where most of the socials and meetings will be held and where meals and refreshments will be served throughout the day. Once you have made your payment you will have confirmed your booking and we will email you further information – including a list of what to bring.